It started with a group of students who wanted to do something about the trash problem on campus. 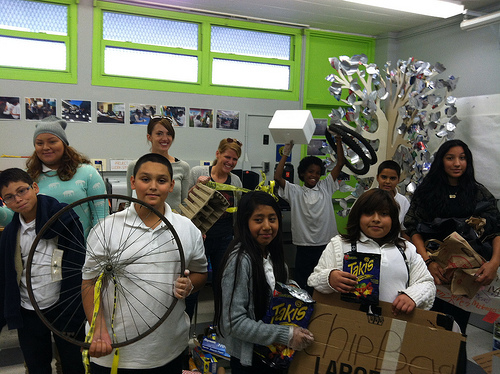 After teaming up with local organization, Ruckus Roots, students are collecting litter and creating a symbolic art installment at Nightingale. The Trashformation project is a great example of how a simple idea can turn into a collaborative effort that results in a lasting impact on the community. A few students were interested in the waste problem in the school and got motivated to do something about it after coming to the D3 Lab. From here, they teamed up with Ruckus Roots, a local eco-activism organization to learn more about how they can turn their concern into a tangible project. After many weeks of brainstorming, researching, and then brainstorming and researching some more, they’re literally turning trash into an art piece that will help to enrich the Nightingale campus. As most positive efforts do, the students have also managed to attract more students so that the number of hands transforming trash to art have multiplied. To learn more and to see the project in action, click here.